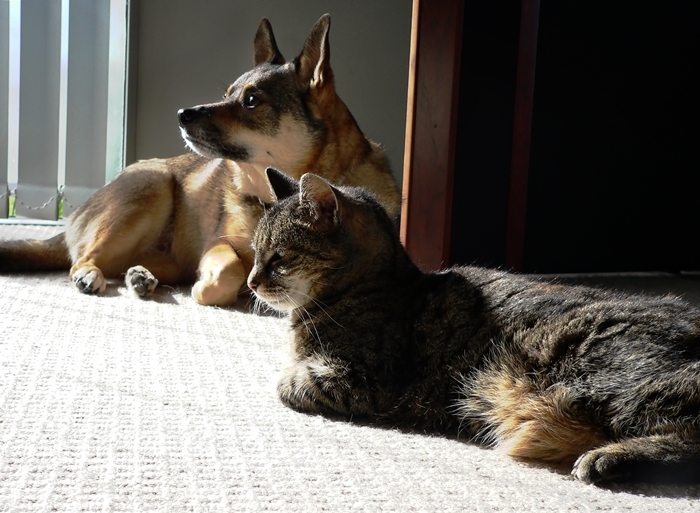 This is the favourite place for our pets to bask in the morning sun where they curl up in line with the beam. This winter both put on a little bit of weight. Good news for Pipi but not very good for the dog. Pipi had some health issues a few months back when she started sneezing frequently and one night she sneezed blood. The vet could not find anything and suspected that there might be some grass seed or grass blade up her nostril and the culprit had already come out with blood and mucous. Apparently, Pipi’s case is not unusual. However, the vet said she was a bit under weight and we should encourage her to eat more. It might be that her nose has not been that brilliant so she could not smell food very well. We try to feed her warm food – putting her bowl 4 or 5 seconds in the microwave normally does the trick.